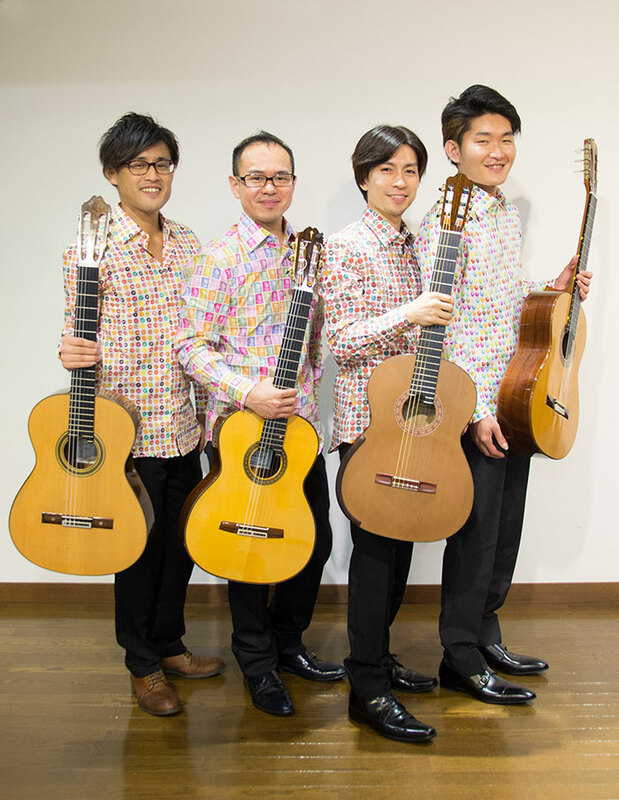 “Quattro Palos” is a guitar quartet to represent Japan and the member is Saito Taishi, Tajikawa Jun-ichi, Haginoya Hidenari and Maeda Tsukasa. This group name is a coined word, and imagines "a huge ship with four posts". They won the victory in “The 21th Japan Guitar Ensemble Competition” and won more “HARUMI prizes” at the same time. In 2013, they demonstrated all the works selected at the "Guitar ensemble composition contest" in the "25th Japan Guitar Ensemble Festival", and they got very popular. In May 2015, they released a 1stCD "¡Leva!". In August, 2016, world's first recording, more than one, 2ndCD which collected composer's works of the included present-day Japan “Amanecer” was released. These things received a good reputation. And they appeared on the cover of the long - established guitar magazine "Gendai guitar", May 2016 and August 2017, respectively. In 2017, they were selected for the first time as a group of guitar playing in the section of "listen to the season's guitarist" in "Hakuju Guitar Festa" which is also a gateway to rookie guitarists, and got a favorable reception. In the same month they appeared in NHK-FM "Recital NOVA". In February 2018, they performed concert tours in the United States across three provinces and received great acclaim from the applause of all standing ovation. In the "Japan Guitar Ensemble Festival", as "Ensemble OZ", they premiered to Siyoh Tomiyama's composition "MOON", D. Cosley's composition "Waltz triptych", Shingo Fujii's composition "Quattro Ritornelli". In addition, they are dedicated by Mr. Shigeru Matsuoka, Siyoh Tomiyama, Shin Sasakubo, Shiki Nagashima, Yoshihiro Koseki and others. They're doing performance activity aggressively at a metropolis in Japan centering on Tokyo environs. Original composition & arrangement in the member is also performed, a new repertoire of guitar ensemble is pursued and a possibility of the guitar ensemble is expanded. The URL of their homepage is here. © 2016 Quattro Palos. All rights reserved.